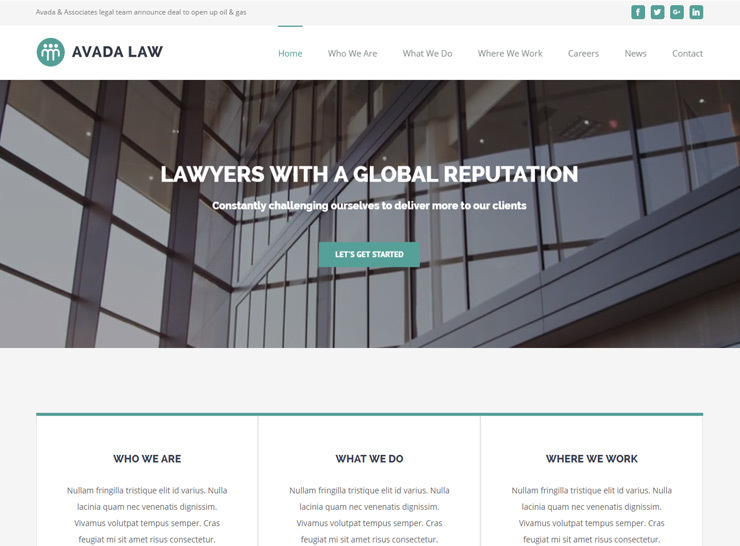 Here is a hand-picked carefully curated list of some of the best lawyer WordPress themes that can be used to build websites for law firms, individual lawyer and attorney websites, consultancy firms, finance companies, among many more. 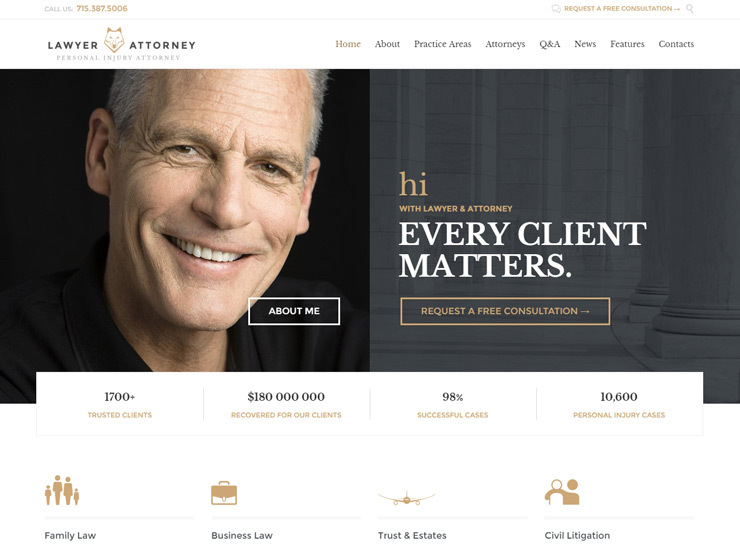 Many lawyer websites even today are still living in the 90s and most attorney websites are boring and bland. They have very dated layouts, are mostly not responsive and not mobile friendly. If you’re looking to build a law firm website, or even a individual attorney website, look no further. 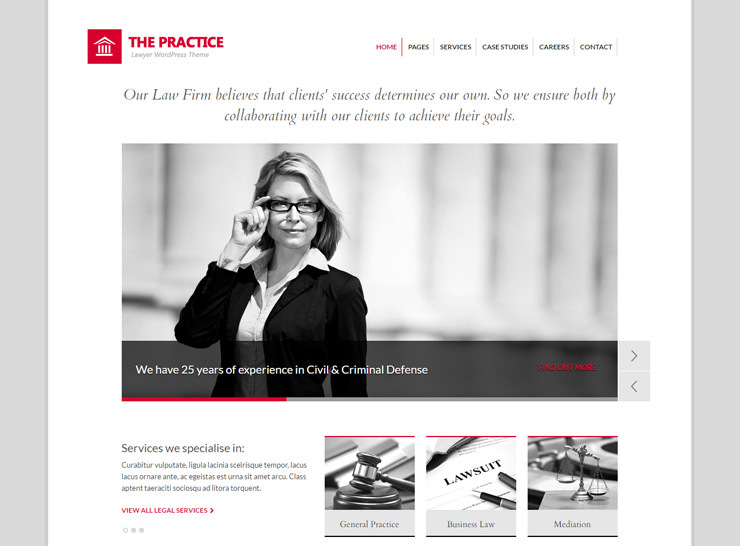 We’ve compiled a comprehensive list of some of the best law firm WordPress themes in the market today. Most of these lawyer themes are highly customizable, and can be used for many different kinds of companies and services, such as law firms, law advisers, legal officers, barristers, consultancy firms, finance companies, solicitors, advocates, and marketing and advertising agencies. Many of the following themes are accompanied with some form of online support, so you will get the help you may need in order to set your new website up. Each of the links below opens in a new window/tab so you can go through the ones you find appealing before making a final decision. Most of these law firm websites can be set up with some customization without the help of a developer. All these lawyer themes require a self-hosted WordPress site. 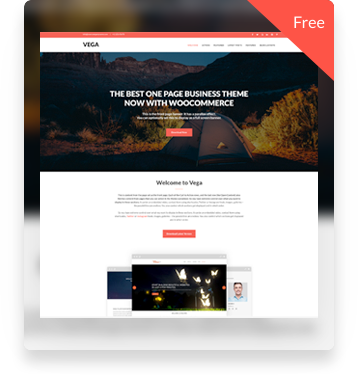 Vega Pro is a a beautifully designed multipurpose theme that is loaded with options. The theme can be customized fairly quickly and has a very intuitive options section. A flexible theme that can be used for a wide variety of purposes, such as a law firm website, business, corporate, creative agency, small business website, or a personal blog. Vega Pro is also a one-page scrolling theme, meaning that it allows you to set up timeless content on the home page and provide the user with links to scroll through the content without leaving the page. 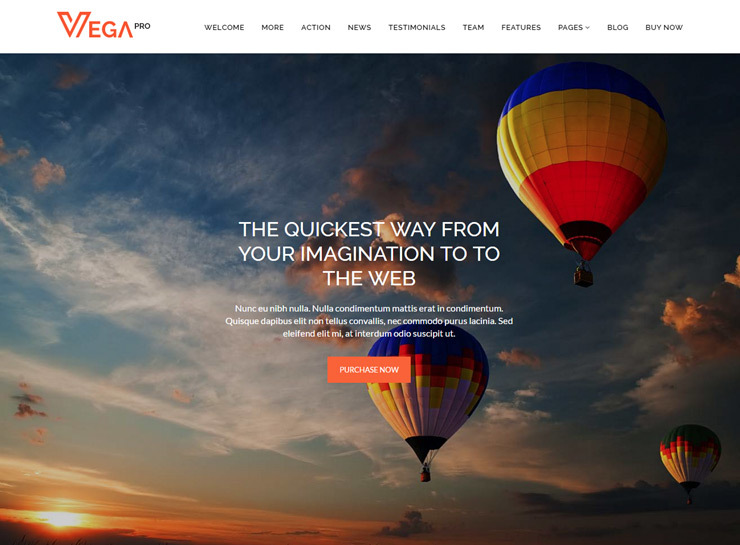 Some of the main features of Vega Pro WordPress theme are: Video slider, image slider, animated Content, pre-built color schemes with the option of your own choice of colors, responsive and mobile friendly, parallax background on the front page, choice of fonts, different banners on all pages, one-page scrolling, translation ready. The Core is more than 16 websites in 1 theme! All the websites are hand built for specific industries, guaranteeing that everything within their structure is well thought out. Each website is unique with the proper design style for that specific industry. 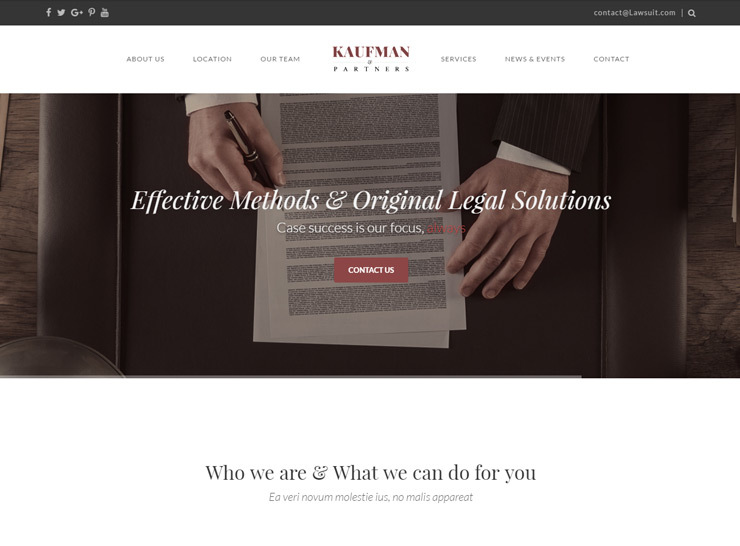 Kaufman, which is specifically designed keeping lawyers in mind, is just of the many layouts you will receive when you buy the theme. It supports a slider on the main page with animated captions, and a centered logo at the top with the navigation split on both sides of the logo. This puts the law firm brand front and center with the visitor. The theme has a visual builder which enables you to drag and drop elements to create complex pages. It also includes three sliders to choose from: Slider Revolution, Layers Slider and a custom-built version. Some of the key features of Kaufman (The Core) are: drag and drop capability to build pages, unlimited color options, three sliders to choose from, woocommerce ready, shortcodes, mega menu, font and typography choices, translation ready, animations, events, portfolio, sticky header, contact form builder, backup module, custom Google maps, bbPress ready, donations ready. Avada needs no introduction – it is one of the best selling themes on the web. Avada is all about building unique, creative and professional websites through industry leading options network without having to touch a line of code. Avada offers a very powerful set of options to create a great looking website. It has been called the “Swiss army knife” of WordPress themes. One of the many demos included with Avada is the Avada Law demo, which can be installed with one click. This layout is specifically designed and structured for law firms and lawyers websites, as well as accounting firms, CPAs, and related professional websites. Some of the main features of Avada are: multiple premium slider options, intuitive fusion builder, mega menu, WooCommerce compatible, compatible with some popular plugins such as bbPress and Gravity Forms, unlimited color options, advanced blog options, custom page templates, RTL and multi language ready along with 30+ translations included, advanced typography and background options, built-in contact form, multiple sidebar options, and many many more! The theme includes one slider with some smooth out of the box animations. There are some special page templates included with the theme such as “About Us”, “Pricing”, and “Case Studies”. 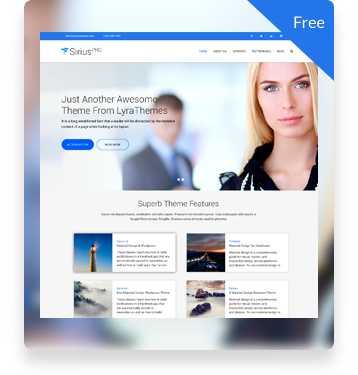 One of the great benefits of this theme is that you can test it for free in the theme developer’s TestLabs area. This allows you to try out all the areas of the theme including the admin area before making a final decision. Some of the main features of The Practice WordPress theme include: The Fuse Framework, shortcodes, contact form module, unlimited sidebars, built-in SEO module, white-label ready framework, translation ready (qTranslate, WPML), auto install demo content (1 Click Content Install), background images, custom page templates. 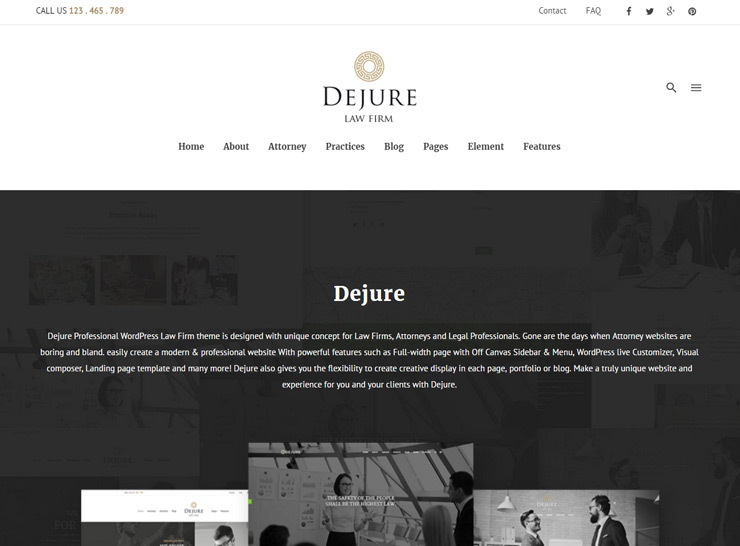 Dejure is another fully customizable theme specifically built for lawyers and law firms. It has special templates to showcase your practice areas, along with information on each practice area page about which lawyers in your firm specialize in those areas. There are at least two page templates to display attorneys bios, with a contact form on each so that potential customers can get in touch with the lawyers. You can make a truly unique website and experience for you and your clients with Dejure. Dejure gives you a lot of flexibility in the header area. You can choose from a multitude of header options, such as logo position (left, center, right), navigation position (under the logo, split navigation on either side of the logo), a dark or a light header. This gives you a lot of control and you can choose the layout that works best for you based on your site content. The theme also provides a “blank” template that removes all navigation from the header and footer, and other common elements so that the page can be used for promotions, to create a coming soon page, or different landing pagee. Main features of Dejure are: blank template (with options to remove header and footer designed for landing pages, coming soon page, maintenance, promotional pages), multi-header option, post types for all your business needs, drag and drop visual composer, responsive sliders, RTL support, page loader, WPML, Google Fonts, mega menu, AJAX powered search, Photoswipe gallery, Off Canvas Sidebar, Google fonts, custom 404 page, full width and boxed layout. Factum is a clean, modern, professionally designed single page WordPress theme specially crafted for law companies, attorneys or legal offices. It provides 4 content types: Services, Personnel, Clients, Testimonials. A full featured website can be built using all or any of these content types. The theme also doubles as a one-page website where most of the vital information can be laid out on a simple yet beautiful homepage. The theme also comes with standard blog functionality, custom widgets, social networking, Twitter and Flickr integration, and multiple color schemes. Some of Factum’s key features: 4 content types, one page website, custom widgets, social media options, Twitter and Flickr integration, clean cut home page with lots of areas for textual content, showcase for attorneys, latest posts, and a simple main page banner. 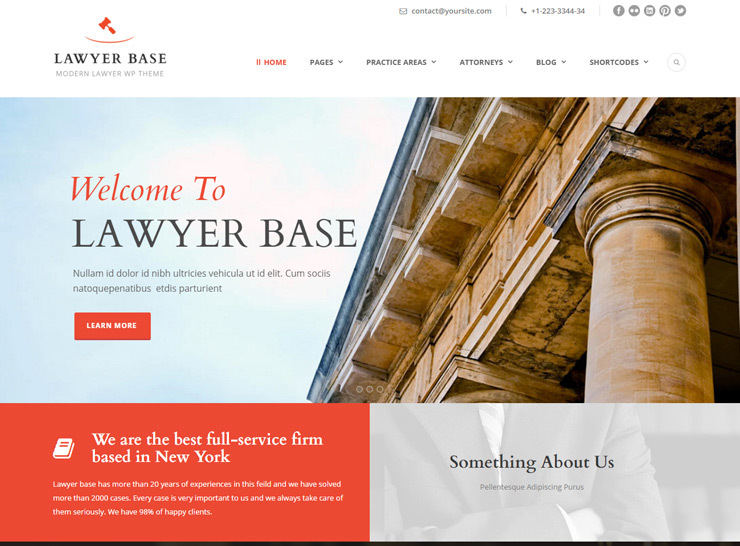 Lawyer Base is a clean, responsive WordPress theme that is specifically designed and developed for law firms. It has a professional yet appealing design with some nice colors and well placed sections. It comes with a page builder using which you can drag and drop elements into place and unlimited colors to choose from. The multiple page template such as for careers, awards, about us, etc. allow you to create a website that suits your content needs. Similarly, the practice areas and attorneys can also be displayed in different formats and you’re not restricted to any particular layout or number of columns. It has some features specific to law firms, such as attorney and practice areas post types. 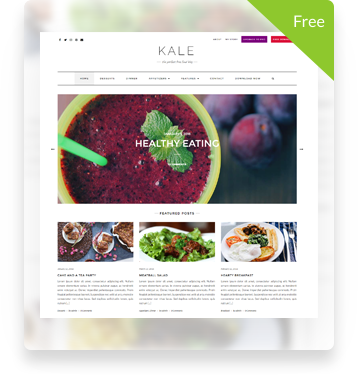 The theme is WooCommerce compatible and supports WPML. The theme comes with the Master Slider that allows you to manage slider elements with ease using its drag and drop ability along with the timeline feature to control slide elements transition periods. Some key features of the Lawyers Base WordPress theme are: attorney post type, practice areas, multiple post formats supported, master slider, goodlayers page builder, goodlayers importer, beautiful admin panel, boxed/full width options, mega menu, 5 project layouts, WooCommerce compatible, WPML supported. The theme comes with the Divi Builder that allows you to craft awesome layouts visually, without coding a single line. 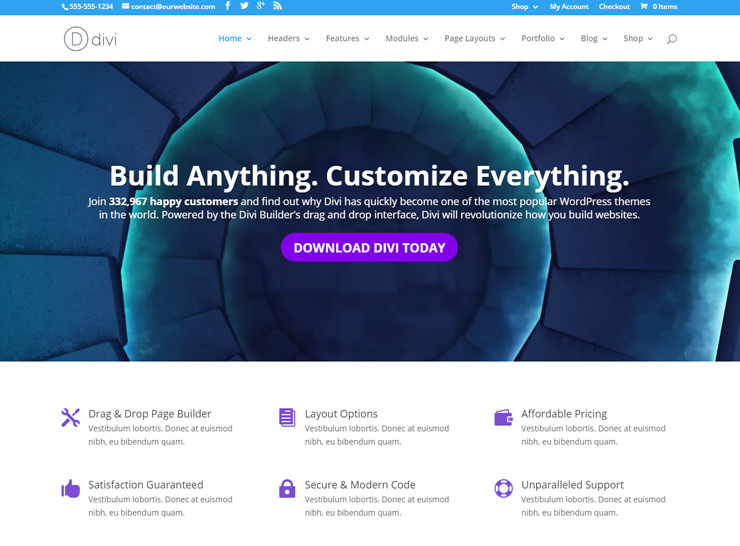 The Divi Builder is the true strength of the Divi theme. If you do not want to build your pages from scratch using the drag and drop builder, the theme ships with 18 pre-made layouts that will help you jumpstart your development. Starting with Divi can be a good option if you’re looking to build a law firm website. With one of the pre-built layouts in position, you can move on to customizing the website with the many tools that Divi offers. Some of the features of Divi include: single page, drag-and-drop options, parallax scrolling, animated slider, media files integration, parallax and video backgrounds, pre-made layouts, advanced design settings, fully customizable, translated into 32 languages. 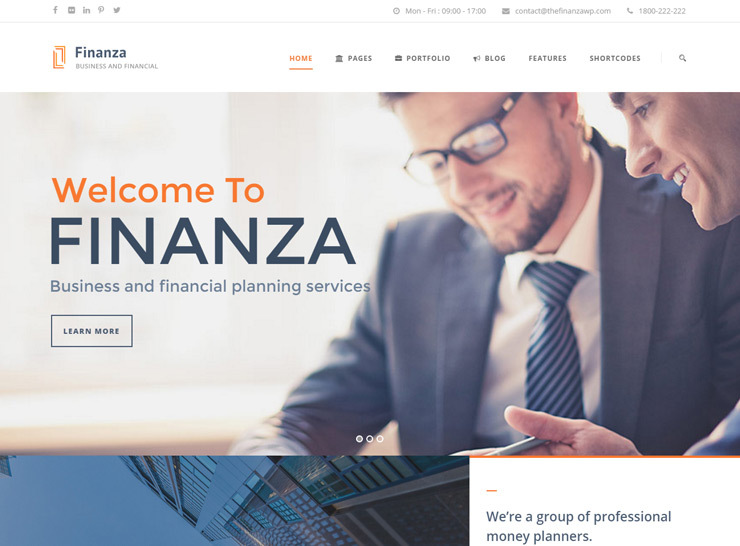 Finanza is a clean, responsive, professionally graphically designer lawyer WordPress theme. The theme is a best seller and well maintained by the team behind it, making it a natural choice for a law firm website. The design is extraordinarily stunning and aesthetically clean, and exudes class and professionalism which is essential for any lawyer website. The theme provides multiple templates for displaying different kinds of information such as personnel and staff, about, honors and awards, portfolio, etc. There are many shortcodes that can be used to create a unique experience for your visitors. The theme comes with a powerful page builder that allows you to create your pages using drag and drop capability. The Master Slider plugin allows you to completely control the slideshow and its transitions creating enganging and vibrant slides to be showcased on your home page. The theme lets you choose from boxed or full width layout and is compatible with Mega Menu. The demo can be imported with one click so you can get started right away by setting up an example site. Key features of Finanza are: WooCommerce compatible, WPML compatible, drag and drop builder, Master Slider, Mega Menu, one click demo import, custom shortcodes, visual editor, unlimited sidebars, custom skin, multiple post formats, portfolio post type. Very nice article. Are these lawyer themes happen to be SEO friendly, if so which one you recommend the most? BESTDESIGNHELP – Thanks for stopping by. Yes, most of the themes presented here are SEO friendly – meaning they have been coded keeping in mind best practices for onsite SEO and some even contain custom SEO related features. We recommend Vega Pro – it comes with a 14 day money back guarantee, so you will get a full refund if it does not work for you. The Core is also a good choice. Best of luck! Great listing. Thanks for sharing.